Well made app that I’ve just started using. I have not yet explored all the features, but what I’ve tried works extremely well. This may be a great GPS app for all I know, but after multiple attempts to download maps for offline use, I have given up and deleted this app without having tried it. I tried to download the maps while using a strong WiFi signal at work and home and can’t get 90% of the maps to complete a download. They get almost finished then stop. 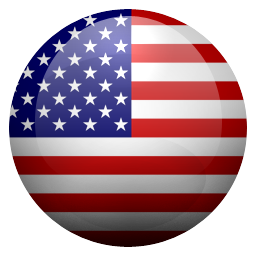 Plus you can’t download the US maps all at once, you need to go map by map to download. Not worth my time. The couple of maps that actually completed downloading took multiple times to get them to finish. Don’t bother. Abkhazia should not be in the list of countries. It is not country, just province of Georgia occupied by Russia. I live in the area north of Albany, NY and some rebellious farmers have fought a war to separate me from my head of government Her Majesty Queen Elizabeth II. I demand that you correct your map and properly show all of the New England and the other colonies as they should be, not as part of a separatist land grab, as part of the United Kingdom!!! I will urge all my fellow loyalists to the crown to boycott this app until the appropriate changes are in effect. Great for traveling in countries where cell service is minimal and WiFi spotty. Seems to be on point. So nice to be able to download and use without a cell service. You can search attractions and food near by. This app has been so helpful. I love the fact that I can download the maps at home, then navigate offline in so many foreign cities where I might otherwise have to pay extra for connectivity. So far, I’ve had excellent experiences with the app. No problems to report. This app has saved me time and time again from getting lost. Would recommend it to anyone traveling abroad! The UI looks bad at the two sides of the notch. I love this app. When I travel I don’t have to use data to use map. Used it on a bike trip in France and it was very helpful! It work in old Morocco Medina that shows no way out on google map but it has all the details of small back alley simile like a maze. It helped me navigate Havana like a local, now I’ll be using it to navigate Mexico City. Most trusted thing I brought with me. It worked very well for me in Sichuan mountain area. I like a lot the offline option. 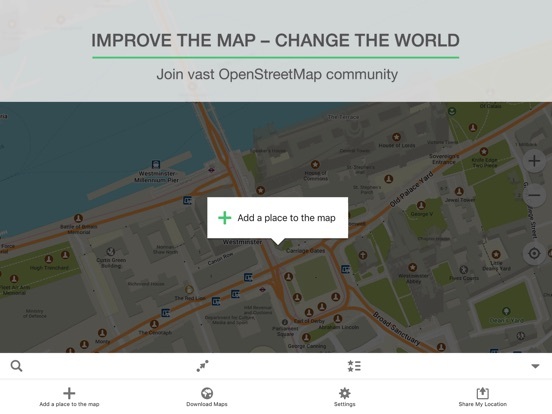 This Map App needs a lot of work, but I want to support it because it uses openstreetmaps. This Map App protects your privacy, and it doesn’t track you in order to sell your personal data like Google Maps. I would rather support a smaller company that respects my privacy. What can I do to make this Map App better? Es una aplicación muy útil. Seems like a very useful app but unfortunately haven’t been able to use it yet. Downloading map is stuck in a loop. It downloads, shows a blue tick and then downloads again. And it doesn’t stop. If I click the blue tick it starts redownloading again. Used on four continents when without a Sim card. Saved me many times in between WiFi doors or out in the middle of nowhere. Only 4 but tempted to give it 5. Easy to download maps. Don’t need WiFi connection on the go. Easy to use. Please... don’t use this app in Costa Rica. Everywhere we went, this app kept sending us away from the main roads and into bumpy ones, dead ends, off roads and all. We used only the map of this app... the “take me there” function is as bad as it gets. Please don’t use it!! Took me only a minute to see that only about 20% of restaurants near me are shown, one had changed its name 9 months ago but showing old name. When Starbucks was searched it is sending me 1.3 miles rather than a closer one less than 1/2 mile away. Thus no trust in the info displayed. 2 stars for nice try, next step.....delete. This appt has taken us all over , without the need to use data. We love it. This app is great. I use it much more than Google Maps, particularly for the ability to easily and reliably save and edit pins I place on the map while traveling in areas without a good cellular network. The search function is lacking, though, as it uses an engine that is propagated by data added mainly by users, so often times it won’t find places I search for. This doesn’t keep me from using the app constantly, though. 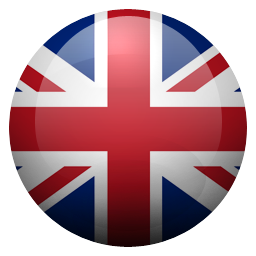 This app has come in handy hundreds of times for me during my travels! 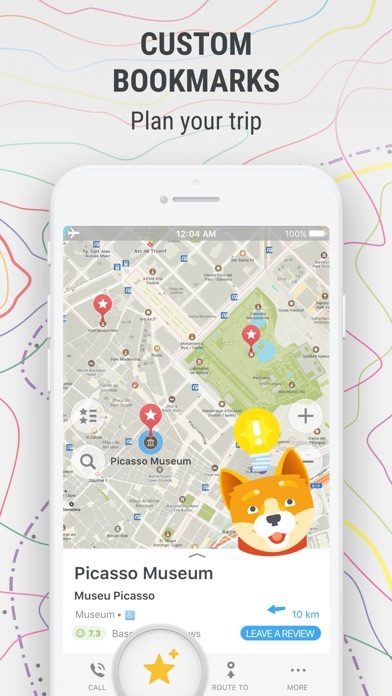 You can find anything around the city and having the feature to download the area map offline is what makes it one of the best travel apps around. Granted I’ve only used it in relatively popular cities like Berlin and Amsterdam. Went to explore the back roads of Puerto Rico. Lost internet and phone but map.me helped us backtrack to safety. Was walking around old San Juan and used it as a city street map. Very useful. Great to use with no service! This app is really great to use when you have no service. I went to Mexico and pre-downloaded areas that I was going to visit and it worked like a charm. You spend all your time “changing your search criteria” that you don’t GO ANYWHERE!!! My Trusty Offline Maps Never Fail Me!! I am really happy with the app, especially now that it backs up and has started adding some info on popular sites! A must have for any traveler, seriously. Don’t know how I did it before. Paper maps? Lol. Great tool for when you are travelling and you do not have access to internet. Traveled to Prague and would’ve got lost. This app didn’t need Wi-Fi. Highly recommend this! This free app is already at the top of the heap simply because it has no ads and in-app purchases. But moreover, it's actually useful! You can use this without an internet connection. This means if you're a cheapskate like me and don't have a data plan, you can still use this. After downloading this app at home, just download the maps you need. The maps are detailed with many POI's included. It'll also create a route from your current location to a destination on the map. It's better than CityMaps2Go which I used before until it started charging a fee. There are a few things I wish they change. First, the name. It doesn't conform with other app names. 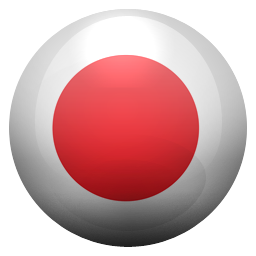 Second, the icon color. Green is usually for chatting apps like Message and FaceTime. And third, either the arrow color or route color need to change when trying to follow a route on the map. Both the arrow color and route color are the same color blue and it's difficult to see where you are along the route. Other than these things, this app is perfect. 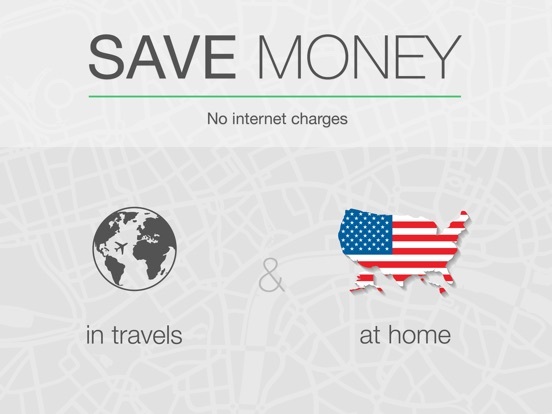 Do you like saving money on international trips? If so, this app is a must. I found it before our 2 week trip to Chile. On that trip, we rented a car and drove 2100 kilometers. In all of that driving, we encountered one waypoint the map didn’t have, and another that was off by two blocks. Because of the completely offline nature of maps and waypoints and directions, we only had to enable cellular once in that two weeks to find that waypoint that was off by two blocks. So just $10 to Verizon for travel pass, instead of the $140 we likely would have paid. One complaint is the turn by turn directions. They could use some tweaking. As is, they sometimes cause you to blow past turns and take a U-turn. Not because of the diver, but because the route did that. It was weird. Also, the voice wasn’t too good at announcing the turns, but luckily my wife was. 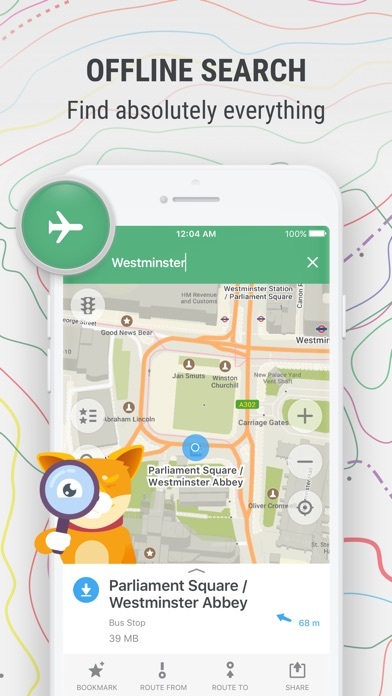 I love the idea of this app - especially as a NYC dweller who always finds myself needing to look up destinations on the subway with no internet connection. I downloaded the NYC map and then tried searching for a destination. Even though I had internet connection, it couldn’t find ANY locations for names of businesses I typed in... frequent destinations that show up #1 on a simple Google search. So I tried to type in the address, which is extremely annoying in an age where no one memorizes addresses or phone numbers anymore, but it literally couldn’t find ANY address. Not a single one. Finally, your nail in the coffin was that there’s zero support for subway directions, which is the only way I get around. A LOT of people in NYC could seriously benefit from this app (since lack of internet on the subway drives us all nuts) but not without transit directions, and DEFINITELY not if you can’t find anything. I’ll revise this rating if you get functionality, because I want this app so badly and would even pay for it, but honestly it’s not ready so I’m deleting it. The Maps app that comes with every Apple phone is a pretty normal navigation app, you have your different views of the map, walking, driving, and more forms of transport. But, that’s it, it’s just a normal maps app with not much added to it, which is disappointing. It will definitely get you where you need to go with a very ordinary display, that isn’t too bad and with pretty good recommended routes. Now, there are some unique features to the Apple maps, you can do a flyover tour, which will show you a view of your desire from a view that resembles that of one you would see from a plane. The Apple maps app is useful and good enough for everyday travel, despite it’s very ordinary features, I recommend you use it if you have no time to download anything else. Used this in a recent trip to Italy, including several smaller cities. Downloaded “the entire country”. Worked great at navigating around the city/village including the smaller ones. Also has a pretty good database of hotels, restaurants, destinations, etc. Some points for improvement (though this is still by far the best offline map app I’ve seen): GPS struggles a bit when “between cities” ie it thinks you are still in the previous city. We were using trains, boat, etc so not really an issue but it might be a problem if you are driving yourself. The search engine for the database of restaurants could use some improvement. It’s very specific on spelling and word order ie “ristorante simbiosi” vs just “simbiosi”. It doesn’t like navigating to a “street address” or “point on the map” which was sometimes a problem in smaller cities where the database didn’t include a restaurant that a guide recommended. Still overall the best offline map app that I’ve used, especially as it includes maps/data for an entire country not just the biggest cities. I live in New England. My husband and I traveled to Vietnam for two weeks. We didn’t have a phone plan and we were able to connect to WiFi everywhere we went. But for the times we didn’t have WiFi this app was a life saver! It didn’t use any of our data and it gave us such great directions. We actually had more fun and seen more things because of it. With this app we purposely got lost because we knew that we can use it to get back to our hotel. It allowed us a more carefree travel experience. I recommend this app to so many other tourists while we were away and my own friends before they went on their trip. Love love love it! I like this app. The ability to download offline maps is really great. The only problem is that you can’t search for street addresses, only for attractions, recreational areas, etc. You can add a custom pin on a map in which it will navigate to you, but if you don’t know where it is, you can’t. Also the ETA to certain destinations can be off, especially offline. 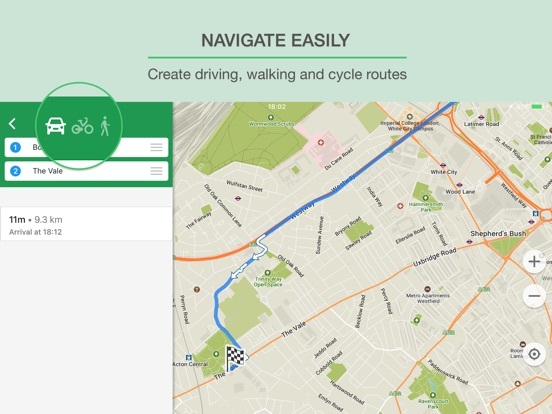 Unlike Google Maps, biking and walking directions are available offline. The navigation system is not the best but works. Unless you walk or bike a lot, or want to download a very large area (like an entire country), I would recommend downloading an offline map with Google Maps, but in any other situation I would recommend this app. This app is wonderful for traveling! With it, I was able to find everything I needed and get where I wanted to go. The ability to put pins on the map was invaluable and well worth the cost. It also told me how far it was to certain places, which was nice. It also helped me find restaurants and gas stations, which was really helpful when traveling in an unfamiliar area. The ability to access maps offline was extremely useful. In sure I'll be using this again in my future travels. Unfortunately it does have some problems. While using the navigation function, it misled us while driving. Also, navigation using public transportation doesn't work at all. I originally got this for overseas travel when I would have my phone in airplane mode most of the time due to data costs. This app got me back to the hotel in Albacete, Spain when I got lost. I now live in a rural area that does not have full cell coverage, and I’ve come to love it even more. The search functions are not great for common vernacular place names, but are getting progressively much better. It works pretty well for standardized, formal place names. The routing is not traffic-aware, but when you can’t get a cell connection, traffic is probably not a problem. This is an awesome app. I would give it 5 stars if they change one thing. The navigation is terrible in one aspect. It tells you to turn at every curve. Where there’s no alternative option. Which is really annoying and potentially confusing. Especially when it tells you to go around a curve that’s just a few feet away from a possible turn. Everyone knows you keep following the road you’re on until you need to turn. They need to avoid extra directions that aren’t needed and focus on giving clear turns when you actually turn. I end up not paying attention especially on curvy roads and then miss a turn because it always says to turn to go around a curve. Also a direct 90 degree turn is NOT a slight right/left. Saved me so many times when not able to access wireless and use maps. I stored destination maps onto my phone before heading out each day and was able to track location and progress as I wandered around small villages in Provence. It is possible to drop a pin to find your way back to a location (think rental car) which is a major relief. After the trip I had pins saved in all the villages to correspond to my photos...that helped. It was fun to watch the little arrow navigate along the road and spin in confusion around the traffic circles in France. 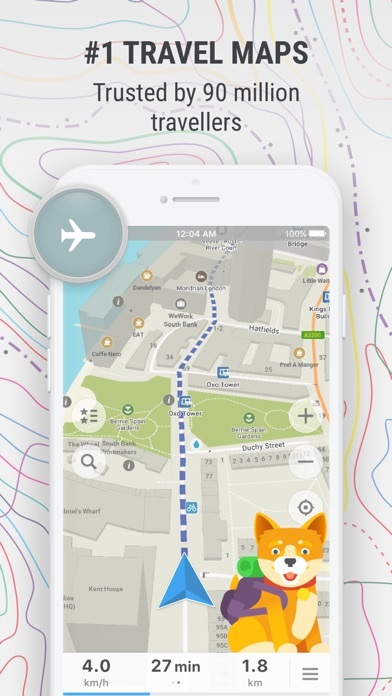 Best travel app ever! I just got back from a 3 week cycle trip to Iceland and nothing was more helpful in that time than this app. We found out about it from a couple after we bumbled through our first few days using other downloaded maps. The fact that you can download an area and use it to give directions offline is amazing. Things are labeled on these maps so well. If you’re going to travel I would highly recommend this. Even for around town it’s replaced google maps for me. If you’re on the fence just take the jump and try this out, you’ll love it. I used this app for Southeast Asia last November for 7 weeks, it made my life much easier I never once needed cell service I was able to download areas over WiFi easily and then I was set. I highly recommend this app for the traveler. I also used it on a couple occasions as a tracker, while kayaking In Hua long bay I left the tracker on and was able to navigate many miles and still find the boat in the middle of a hundred islands ( probably would have never found it) and made me feel very confident I could find my way back many times throughout my travels. Thanks maps me. ### May 20, 2018 ### The app seems to be draining battery, so I try not to use the app when battery level is low. ### Original Post ### I liked the old version of the app much better than the new one. The old one allowed me to download small data without downloading the data for navigation, and the old one did not ask me to turn on the location service every time when I launched the app. The new one forces me to download large data and keeps asking me to turn on the location service. If this map can be used offline, I do not know why the app keeps asking me to turn on the location service. I am very disappointed with the new one (1 star), but it may be still better than other offline map apps (+ 1star). Unable to search for a specific address. It will find a street. But where on that street you want to go is up to you. So you have to know where you're going and perhaps use the app for routing and turn by turn. Even that is a pain for data entry as you need to enter a cross street. Well, again you have to know where you want to go before you can enter the cross street it's near. As the GIS maps I'm familiar with have address capability, my curiosity got to me. Seems apps that use GIS addresses are widgets or plug-ins, computer based and require the internet (not off-line). So don't expect this app to be updated for address capability. 2 stars is somewhat of a gift. For me, the app is useless. I frankly don't get the favorable reviews. We downloaded and used the Cuba version of the app, given the issues with internet access. It was excellent - always at the ready with nearby cafes, restaurants and historical sites, complete with user ratings and reviews. Super accurate, and was somehow able to know my location using some sort of location aware system even though my data was completely off. I used it with Cuban Taxi drivers who didn’t exactly know their way to certain addresses. Great tool! I’m traveling in Paris right now and didn’t want to turn on my data, so I was looking for a good maps app to use while here. Well folks look no further. This app has very detailed and accurate maps, great walking directions, the ability to search for different things, and the great this is I haven’t had to turn off airplane mode the entire time I’ve been here. If you are going to Europe and don’t want to spend money on international data, this app is 100% the best offline maps app out there! Love this app. I use it on vacation and it keeps us from getting lost when there is no WiFi. The maps do take up a lot of memory, but I don’t care about that because I usually have memory to spare. It gives you walking, driving, bicycling and transit estimated travel times. It allows you to mark and name your own places, such as ‘our hotel’ or ‘flea market’ or ‘dress shop’. It has saved us so many times that I can’t say enough good things about it. We use it extensively in Europe and at home. Can't bring back the list of search results. When I search for a starbucks for example: A list comes up with all the shops. I select one from the list and it displays it on a map. After I select one from the list, I can't go back to the list of search results. Please fix! And also, if possible, when in search results list view, to include a compass arrows in each row which will point towards all these particular locations. Just like the compass arrow that shows up on the bottom right corner after I select an item from search results. Great detail, often more useful than (even when available) Apple maps. More attractive than Google maps. Takes up very little space. 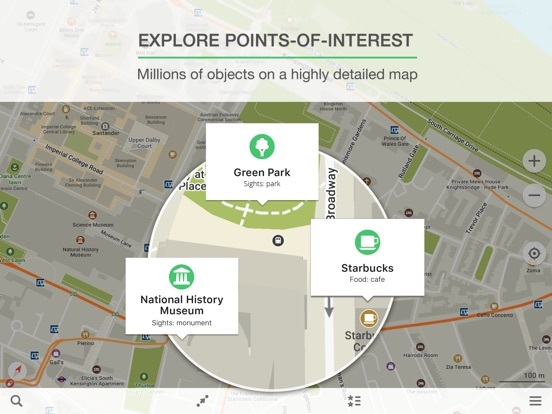 Enough landmarks and restaurants/hotels to help identify different kinds of neighborhoods. Have used the app in upscale cities, back country wayfinding, third world ratty places and have not found any reason to complain. Caution: as with ALL mapping ‘ware, don’t bet your life on it. Have found some places marked way off base. Where has this program been all my life. I have been looking for an app for your offline nav for a while. I was satisfied with Google maps offline features till I figured out it can't download about 50% of the world. This program solves all of that. Another person reviewing had said that it had no ads or in app purchases. This is inaccurate, but the ads are very unnoticeable, and for a price of $4 a year or seems like a good deal to support an app like this. Search doesn’t work. Annoying warnings. This app is becoming more and more of a marketing platform, while obvious improvement requests by users are simply shunned. The infantile location services warning, for example, has been plaguing the app for years now, and for absolutely no good reason. Despite many reviews calling to remove this and despite writing the devs on several occasions, this silliness persists. Search, the second most important feature after graphical map display, is nearly useless. It displays results that are hundreds of kilometers away AND don’t match the typed term, above those that are clearly there, are a better match, and are way closer to you. This has been pointed out to the devs a hundred times, and with every other update they claim to “fix” or “improve” the search, yet nothing. Zero progress. Instead they are working on monetizing this thing and displaying ads related to places and businesses. Typical money grabbing team with zero regard for the end user. Stay away. Five star reviews are probably from their own employees and friends. I love having this; I first downloaded it before a cross-country road trip, so I would always have a map and navigation if I had GPS. You can add custom locations, and the search function is quite good. On the other hand, the directions the app gives make absolutely no real-world sense, and on top of that, the estimated travel times are delusional - 57 minutes to travel 65 miles, driving solely on state highways and back roads, for example. It wold be wonderful if it could deliver on its promised travel times... Anyways, well worth downloading despite that. An otherwise great app that doesn’t stop sending you insipid notifications. Today’s had a cat-with-hearts-for-eyes emoji. This was mostly useful while traveling in Southeast Asia, but even with data on, the point of interest and address search frequently failed to find the right spot while google or Apple maps succeeded. But if what you need is a generally accurate map of streets, including small streets, while traveling abroad and trying to stay off data roaming (or unable to use wifi/cellular data), this app fits the bill. This app has saved me so many times. I don’t know how it does it but it can find me anywhere even with my data turned off. Even on airplane mode. It finds landmarks. It routes them. It is a compass. I can watch us walking down the street. And we can find where we need to go. Indispensable app for trips especially outside one’s data range if trying to save money by being offline. Best offline app there is. Almost as good as Google maps but no internet needed to operate. I use it all the time when overseas and my data is shut off to save money. It uses gps so you can walk around any city and never get lost. I won't leave home without it. You can put pins in locations before you travel and locate monuments and restaurants. It knows where all public toilets are even in remote villages in France. Used this everywhere from rural Ethiopia, DR, and upstate NewYork to New Jersey, France, and Ireland. It has never let me down. An essential product for those places that still don't have wifi, GPS, or phone signal--and that is more than you think. But even if you can log into those Other maps, why would you? This one has a clean design, easy interface, and the advantage of crowd sourced sites that are not commercially funded! I loved the application, especially since it worked really well offline. Most apps would lure you as being offline, but always ask for upgrade. Well this app really worked. It was easy to get from one place to another and you did not have to put the exact address, just the name of location would work. No adds, no request for upgrades, just great! I found this to be the best travel app when we were at RVing down the East Coast you can download Maps ahead of time and zero win when you’re off-line to find out where you are and what’s around you it seems to be able to grab nearby open Wi-Fi’s. I was able to use pushpins to keep track of where we stayed in important places we visited. Found this very helpful wouldn’t travel without it. We used this app extensively while traveling in Scotland and Iceland this past summer, and it was great. It required no international data, got us from place to place efficiently, and was much more functional than Google’s offline Maps. If there’s any downside, it’s that POI’s may not have been updated in a while, and that it seems to be more of a battery hog than Google Maps or Waze. My internet connection is WiFi only, so I can’t use most apps that rely on it. This app, once I downloaded the map of the city from the menu (takes 2 seconds) I was able to look at any time to see my location. Then just plug in the address or name of the place you want to visit and how you want to get there and boom, it plots out the path and in my case, the metros to take. Life saver! I was traveling alone in Denmark with no data and my first day in Copenhagen I had no idea where to go for approximately 3-4 hours a tour guide showed me this app and with its preciseness and ability to work offline it made my trip so much easier I could get around easily whether it be by the train/metro or walking whichever I choose I definitely can’t advise more to get this app when traveling anywhere. Used this app a ton recently while in Australia and New Zealand. As long as you download the right maps beforehand, this takes a lot of stress out of finding your way around strange cities! Can't believe it's free, I can't recommend this enough. This is actually the first app review I can remember writing. And now they are adding subways and trains to it, soon it will be as good as google maps but offline. It's basically the app that stayed on my iphone as long as I can remember without being deleted or even moved, like if it was an iOS factory app, first app to install after a restore, first app to install on a new iphone, first app to update when ever there's an update, I like apps, I love some and I hate some, some of them are amazing, some of them are crap, but this... no emotions involved, this a must have, end of the story. Thanks to whomever made this app. While I have “unlimited” data-overseas through my cattier, it’s capped at 2G speeds. This app has made navigating seamless and has spared my phone’s battery (as it doesn’t need to constantly pull a connection). I am endlessly grateful for the hard work of these developers and the fact that they made it free to use without a bombardment of ads or up-selling. Awesome work! Tokyo here we go! This map was so useful to use when I traveled to Vietnam. I did not have 3G, so I could download the local map on wifi, drop pins on where I wanted to go and then when I was outside, The geolocation from the phone could place you on the map and show which direction you were facing. I could also drop pins as I walked Really recommend this if you are traveling! Best international map app for exploring. I have used it for years in Asia, Canada and the USA. I have also used it many times offline when hiking. I very much like the bookmark feature and use it when traveling to map out the places I’m staying. Unfortunately it is not great for driving directions but hope it keeps improving. I never travel or hike without this app! Bravo! Finally someone thought of navigation App without data charges! So useful if you are abroad, and on hiking trials. I also Love that it has all, - bicycle routes, hiking routes along with car routes in it. Not to mention traffic alerts and pretty amazing graphics! So far it has been pretty accurate in routing any of my destinations. All thumbs up!!! Reminder: DO NOT FORGET TO DOWNLOAD THE MAPS. You need to go to the setting and choose the country/ies you want to download using WiFi. It’s a great app for keep. Very useful specially if you are out of the country and have no data. 100% worked well. With little floss when it comes to accuracy but no problem with me since you use it for free and not spending hundreds of dollars for data roaming fee. It's great to be able to have a detailed offline map anywhere in the world that's so easy to use. And the maps are kept up to date, you are notified when an updated download is available. I love it foe directions in NYC, where I can get not only transit directions, but then the walking directions to get to my destinations (with distances, very useful). This App was recommended by a fellow traveler one week into a year long trip. When you have access to wifi or data, download your map, then turn off data and go. 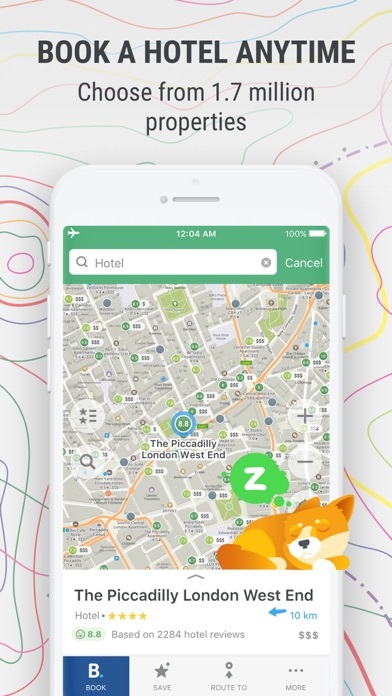 The App knows where you are, provides directions between locations, has an easy searchable guide for hotels, bus stations, food, etc. Get this. I’ve used this several times where AT&T coverage is poor or doesn’t exist. Being able to see where you are, have been and going is one reason to carry a ‘smart’ phone only instead of with a handheld GPS. Just be sure to download and update the maps for where you’re going BEFORE going ‘off the grid’. Downloading maps is awesome. They are relatively small and while the interface isn’t great, I could use it. BUT actually using these maps is horrible! I can have an area on the screen and also in Google maps, and I cant even tell they are the same area! I couldn’t even find Interstate Highways - they are the same size as local roads with no special numbers or symbols. It looks good at a glance, but trying to actually USE the map was very difficult. Interstates are HUGE, they should always stand out! I downloaded this app in Brazil for all the hikes I was doing out there. The accuracy was outstanding! I used it again in Austin and then LA and Yosemite, and it didn’t fail. I recommend this to anyone that is going hiking or to a country/place they don’t know. The download feature makes it extremely helpful for when you don’t have service (most hikes that are worth it).